MISSISSAUGA, ON – A brewery opening soon in Mississauga’s Port Credit neighbourhood has announced the release of its first beer. Stonehooker Brewing has been established by owner Ross Noel and brewer Adam Cherry, and is named after the role that Port Credit played as a port for fleets of stonehooking schooners that gathered stone slabs out of the shallows of Lake Ontario to be used for building construction in 19th and early 20th centuries. Juicy! Hazy! Delicious! Big tropical and citrus flavours and aromas from Mosaic, Vic Secret and Simcoe. Low bitterness with a soft creamy mouthfeel. So good we made it our first flagship beer. Give me another! 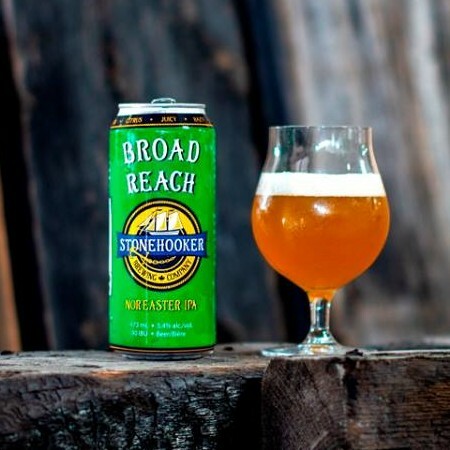 Broad Reach is available now at several local bars and restaurants, and will be on tap and in cans at Stonehooker when it opens, alongside a selection of other brands including Steampunk Saison, Three Sheet Tripel, Weiss is Neiss Hefeweizen, Firkin Hawsehole Imperial Stout, Four Sisters Coal Stout, Mad Capreol Porter, Double Block DIPA, Sawmill Sid Logger, and Mae West Mango Milkshake IPA. Stonehooker Brewing will be opening its taproom and retail store on Friday September 14th at 866 Lakeshore Rd. E. in Mississauga. For more details, see the brewery’s website and Facebook page.